Carol's Theatre Reviews ~ It's Fun To Go Out: “Abundance” is a J & J double whammy of a winner. “Abundance” is a J & J double whammy of a winner. There’s some kind of dynamic duo energy going on at Moxie Theatre these days. New kid on the block Backyard Renaissance Theatre is mounting Beth Henley’s “Abundance”. “Abundance” is Henley’s tragi-comedy spanning 25 years in the lives of two mail order brides, Bess (Jessica John) and Macon (Jacque Wilke). They meet at a train stop while awaiting their prospective mates. It has its beginnings in 1868 on the Wyoming frontier. Henley’s “Abundance” is mixed with humor, love, friendship, trust, dreams and expectations, passion, disappointments and courage. Its about two women who form an instant bond, who become sisters, strangers adversaries and soul mates over the course of a quarter century. That these women were able to form this close -knit community at the outset had to be an act of fate. Two more different personalities under different circumstances would have gone their separate ways but necessity, fortune, loneliness and the fact that they were so opposite brought them together… for a while at least. Bess is shy, dreamy, wistful and afraid to rock the boat. Compared to Macon’s energetic, sure if herself pioneer spirit the two manage to complement each other. As fate would have it timid Bess ends up with the brother of the man that was to be her intended (he died…don’t ask). He turns out to be the brutishly handsome, overly abusive Jack Flan (Francis Gercke). Macon’s mate is the passive, timorous one-eyed Will Curtis (Brian Mackey). Neither is a marriage made in heaven. Over the years Macon and Will settle into a workable but rocky existence as their fortunes grow. She seeks the impossible; he wants the reasonable. The same cannot be said of Bess and Jack. Again fate steps in and the sameness of their lives changes dramatically as ‘turn about’ might not necessarily be fair play, but Henley no stranger to change sets all four characters on paths no one would expect. 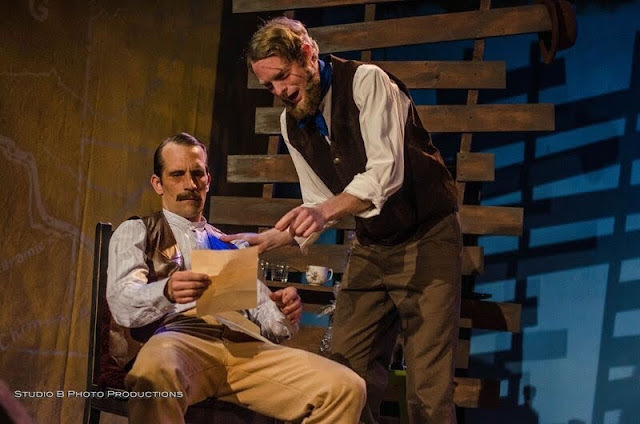 Co-directed with an eye for both the comic and tragic Francis Gercke and Anthony Methvin have chosen the dynamic duo of Jessica John and Jacque Wilke to portray the two mail order brides. I can't imagine a more compatible duo to embrace these charactres. Wilke is the larger than life Macon. 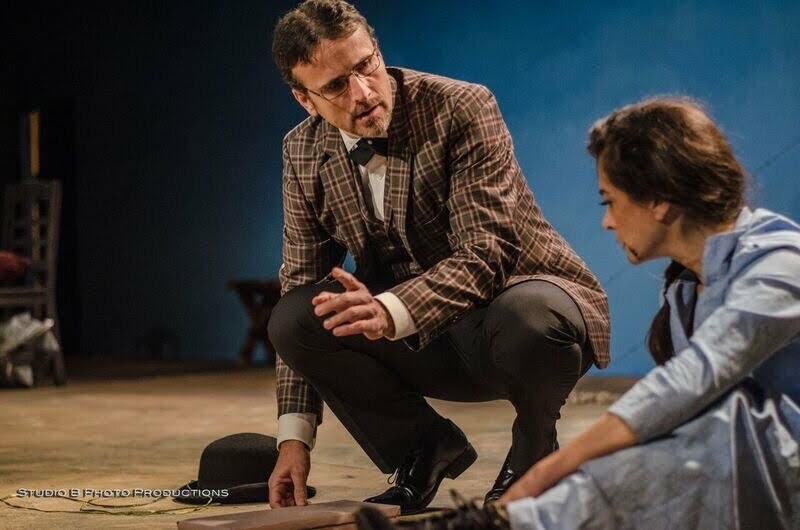 Her spirit radiates throughout the play and her boldness, good bad or indifferent, is authoritative and on solid footing. She shines in this role. Jessica John is perfect as the frightened and withdrawn Bess in Act I and convincing and steady as their worlds turn in Act II. Both women bring an energy so convincing that on some level its difficult to decide exactly what the fate of their lives will become. Both are survivors. Both play off each other to perfection. There is definitely synergy there. Gercke and Mackey are up to the task as well. Gercke is contemptible, brutal and smug. If one could horsewhip him it wouldn’t suffice for the way he treats his wife. Mackey on the other hand shows a softer and more sympathetic side; one that knows right from wrong and plays the cards as he sees them. He also adds some comic relief in an odd sort of Henley way. Adding to the cast later on David Raines comes on as Professor Elmore Crome who exploits Bess’ experiences in the West. It’s a thankless part, but he manages it well. Ron Logan’s set is as barren as the wilderness they are trying to tame. Wooden planks, chairs, a bench and scant knickknacks personify the living conditions. Lining the walls is a map of the Wyoming territory. AJ Paulin’s lighting with Samantha Vesco’s period costumes and Matt Lescault-Woods sound design add to the overall freshness of a very current topic of conversation on the role women play in today’s society, not to mention the women pioneers that ventured into the untamed and stood by each other. That was explicitly clear in Henley’s final scene of reconciliation. If you’ve never seen “Abundance” I highly recommend you catch this production. If you have seen it in the past, it’s long overdue for another look-see. 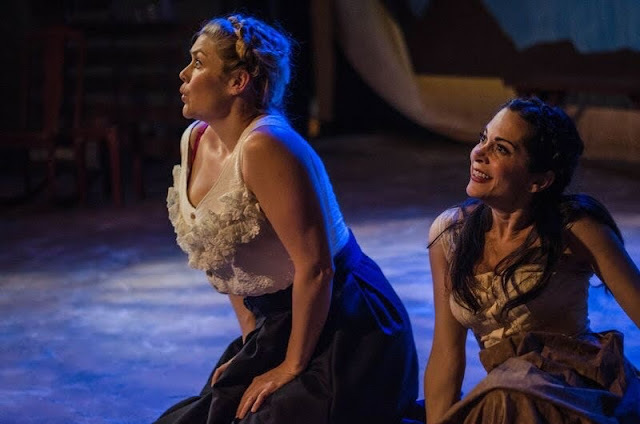 Since women play such a dominant role in all of the playwright’s plays and women are at the helm of so many of our theatre companies it's refreshing to follow the trajectory women throughout the centuries have played in our lives. See it before it closes, you won’t be sorry. See you at the theatre.